Willian scored 13 goals and provided 12 assists in 55 appearances for Chelsea last seasonChelsea winger Willian says there is "no chance" he would be at the club had former head coach Antonio Conte still been in charge. 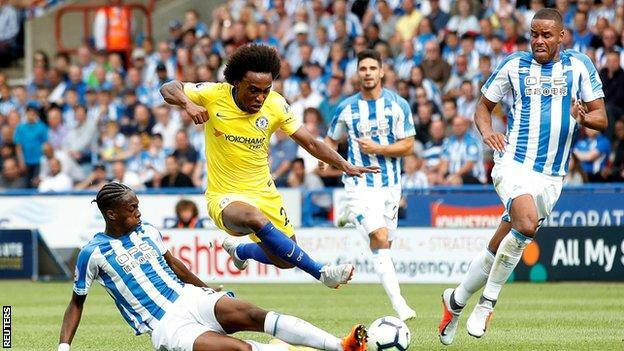 Conte won the 2016-17 Premier League title with the Blues but was sacked in July after finishing fifth.His replacement, fellow Italian Maurizio Sarri, won his first Premier League match in charge, 3-0 at Huddersfield on Saturday. Brazilian Willian, 30, was linked with Barcelona, Real Madrid and Manchester United this summer but committed his future to the Blues in early August.Asked whether he would have stayed if Conte had not been fired, he told the Evening Standard:[/i] "No chance. No. I'm here because I want to play for Chelsea. I will only leave if Chelsea want me to go. "Chelsea are at home to Arsenal in their next league fixture on Saturday, and Willian added: "Now we have a different style, that's why we can create problems for Arsenal. "Of course, it will be a special game against Arsenal because it is a derby. It is always difficult against them. We have to prepare well during the week."